Very clean and modern office. Front desk personnal very polite and efficient. Work write-up and proposed dental work waspresented in very to understand manner. Very clean and modern office. Front desk personnal very polite and efficient. Work write-up and proposed dental work was presented in very to understand manner. Very polished, knowledgeable, and professional. The cleaning service exceeded expectations. He was honest and transparentabout a dental issue I was having and gave me a reasonable plan for next steps. The pricing and check out service was seamless and hassle free. Overall first impressions on this first visit were awesome. Very polished, knowledgeable, and professional. The cleaning service exceeded expectations. He was honest and transparent about a dental issue I was having and gave me a reasonableplan for next steps. The pricing and check out service was seamless and hassle free. Overall first impressions on this first visit were awesome. Dr. Anderson always said that being a dentist is a truly blessing for him because he has a job that he loves, he really enjoys the interaction with patients, treating them as they would be his own family. 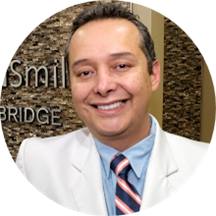 His passion for what he is doing grows each year, as he continually witnesses the effect that dentistry has on the lifes of his patients. Dr. Anderson was born in Lima, Peru. He attended Cayetano Heredia Peruvian University, where he graduated in 2000. After training himself in Peru in many aspects of dentistry, he decided to come to the United States for special training at the Advanced Education in General Dentistry Program at University of Connecticut where he finished 2 years of Residency, following for a one year of Fellowship. After that, he became a Clinical Instructor from the AEGD program. He has been practicing in the area of Northern Virginia since 2010. Dr. Anderson enjoys to spend his free time with his lovely wife Eliana and their children, Nicholas and Ian, who keeps them joyfully active. Visit was pleasant. Rose was the hygienist who cleaned my teeth. She was honest but nice and didn't make me feel bad for not getting regular cleanings. Dr. Anderson saw me for about 2 minutes and didn't really even look inmy mouth. He looked at my x-rays told me I had some cavities and said he'll see me next time. He was nice but I was shocked he didn't look at my teeth ..
His very friendly. And the wait time was very short . First time appointment for my son and was.... Amazing!!! He loves the dentist!!!! Thanks Dr. A!!! My family decided to switch dentist because we did not feel comportable, with a lot of fear we choose Renovasmiles and we were blessed to find them, everybody is extremely nice, front desk, assistants, everybody, and the hygienist Lin and Dr. Anderson are exceptional healthcare providers, Thanks for everything! His staff are very professional and provide superb service, especially Juan who is Hospitable and competent employee. Thank you for your service. Dr. Anderson was very attentive, professional and friendly. I was really happy with his diagnosis, and how he explained the necessary steps to fix it. Excellent Doctor, very nice front desk, they make you feel comfortable, Dr. Anderson is the best!!! Dr. Anderson lacks basic communication skills with patients and was unprofessional in his approach. I would not return to him. Amazing experience!! Doctor is the best!!! The visit was quick and painless. Thank you Dr. Anderson. I was very anxious about selecting a dentist from the network list provided by my insurance provider. From entering RenovaSmiles office through completion of the dental work that had to be done, I was completely satisfied. The atmosphere inthis office is friendly and professional. Dr. Anderson and his staff made my experience painless. I highly recommend RenovaSmiles and Dr. Joshua Anderson for all your dental services. Excellent!! Dr. Anderson AND his whole staff made me feel at home, very welcoming! I've been here many times in the last two months, and have always had an enjoyable experience especially with his amazing and smiley staff - they're always so friendly. Initially, I was not used to a practice that worked a lotwith assistants and was skeptical but they proved to be professional and kind. I do think, however, that while Dr Anderson is skilled, he may want to slow it down a bit. I sense this level of stress and need to rush that I see in most desk workers and not expected of a dentist. I'd expect my medical professionals to take it easy. Shouldn't be too difficult to fix. I'd still recommend them. A very friendly and competent staff. Felt the service from the staff was very professional and very well explained. Once in the dentist chair the whole process was efficient. Dr. Anderson is great and very fast without sacrificing quality or patient communication. But even better is his staff -- the hygienist is one of the nicest folks I've ever encountered in the medical profession, and the administrative folks were extremely thorough in explaining my benefits and options. The place was okay, not the nicest or largest but it was fine. The staff was very nice and so was the doctor, but he tried getting me to do a full mouth debridement when all I needed was a cleaning....Be sure to get a second or even third opinion before going through with anything. I really enjoyed this dentist. Everyone in the office was friendly. No one tried to convince me to get things I didn't need. I just wish they integrated with ZocDoc more, had to fill out forms when my information is already on the site. Always a great, prompt, thorough, and pleasant experience. Great visit, beginning with Sonya's warm welcome, and the attentiveness to the patients needs by the entire staff. I am looking forward to my next visit. Dr. Anderson was patient and kind. He and his staff are very friendly and professional. Juan took the time to thoroughly explain my treatment plan. I feel like I am in good hands. I found my new dentist ! I was given a RX for medication that I am allergic to and was not asked if I had any allergy . Everyone was very friendly and professional. It was a great visit. Excellent Dentist! Extremely knowledgeable and capable, the staff are well-versed in the insurance specifics. Great care all around. Excellent denistry. Had root canal done with minimal pain afterwards. The office works with you financially as well. Great dentist. Very nice, really gentle. Didn't mind waiting since he is a no BS, awesome dentist.